Comfoflex Lining Kevlar Stitched Reinforced Palm..
Aluminized layer reflects 95 percent radiant heat offers cool comfort and extend usage of welding gl.. Same as our original 10-2000 with added multi layering technology for maximum protection. Aluminized..
Cut level - 3 Size - 10 Designed and developed as a breathable cut resistant glove, MaxiCut..
Cut level - 3 Size - 11 Designed and developed as a breathable cut resistant glove, MaxiCut..
Cut level - 2 Size - 10 Designed and developed as a breathable cut resistant glove, MaxiCut..
Cut level - 2 Size - 9 Designed and developed as a breathable cut resistant glove, MaxiCut..
A light weight general purpose assembly glove for those requiring precision handling in oily or wet .. Designed for general handling in wet or dry applications in cold conditions. 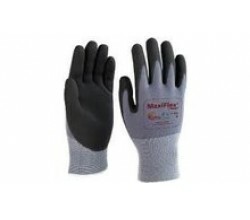 Tough and flexible c..
Cut level - 5 Size - 10 Designed and developed as a breathable cut resistant glove, MaxiCut.. Designed and developed as a breathable glove. Precision handling in dry enviroments. 25% thinner t.. Box of 100 Protects hands against contamination, dirt and potential irritants in low risk situation..